Carol Padden, an award-winning scholar of sign languages and a longtime member of the University of California, San Diego community, was appointed Dean of the Division of Social Sciences at University of California San Diego, effective October 1, 2014. The appointment followed an extensive national search. 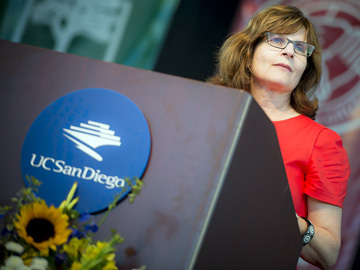 A recipient of the MacArthur Fellowship, popularly known as the “genius grant,” Padden has been on the faculty of the UC San Diego Department of Communication since 1983, when she earned her Ph.D. from the university’s Department of Linguistics. An affiliate member of the Center for Research in Language, the Human Development Program and the Department of Education Studies, Padden served as associate dean and faculty equity advisor in the Division of Social Sciences from 2008 to 2013. At the time of her appointment, she was serving as UC San Diego’s Interim Vice Chancellor for Equity, Diversity and Inclusion. Padden’s main areas of research are language emergence, sign-language structure, and cultural life in Deaf communities. She plays a central role in promoting research on sign languages around the world and in shaping policy and practices that promote the full participation of deaf people in society. As dean, Padden will lead a dynamic and highly ranked academic division with more than 9,000 undergraduates, 600 graduate students, and faculty spanning 10 academic departments and 16 interdisciplinary programs and research centers that focus on some of the most pressing and important social issues of our time. Holder of the Sanford I. Berman Chair in Language and Human Communication in the Division of Social Sciences, Padden wa named a MacArthur Fellow by the John D. and Catherine T. MacArthur Foundation in 2010. She was cited for “illuminating the unique structure and evolution of sign languages and the specific social implications of signed communication.” Other distinctions include being elected a fellow of the American Association for the Advancement of Science and the Linguistic Society of America. She is also a recipient of the John Simon Guggenheim Fellowship, a UC San Diego Faculty Research Lecture award, a UC San Diego Chancellor’s Associates Outstanding Faculty award and a Laurent Clerc Cultural Award for distinguished contributions to the field of deafness. Her research is funded by the National Institutes of Health and the National Science Foundation. She has also received research support from the U.S. Department of Education and the Spencer Foundation. Padden has published widely in areas relating to language evolution, culture and genes, comparative sign language structure, reading in deaf children and Deaf Community history. Together with her husband Tom Humphries, who is also a member of the UC San Diego faculty, Padden has published two textbooks on American Sign Language [A Basic Course in American Sign Language (1980), and Learning American Sign Language (1992)], and two ground-breaking books about the history of the Deaf community in the U.S. [Deaf in America: Voices from a Culture (1990), and Inside Deaf Culture (2008)]. In 2005, Padden, with colleagues from the University of Haifa and Stony Brook University, published an analysis of the Al-Sayyid Bedouin Sign Language, a language created in a small village in Israel’s Negev Desert. The PNAS paper was the first linguistic analysis of a language arising naturally with no outside influence, and the findings made headlines in national and international press. In 2008, New York Times reporter Margalit Fox chronicled her travels with the research team in a book titled Talking Hands: What Sign Language Reveals About the Mind. Padden was born in Washington, D.C., the second deaf child of Deaf parents [Agnes and Don] who were both on the faculty at Gallaudet University. She first attended a school for deaf children but transferred to the public school system in third grade. It was a long adjustment for her and one she describes as being “akin to being educated abroad.” Her interest in linguistics and culture, she writes, “is strongly rooted” in those formative experiences of “moving between different worlds and languages,” between the hearing world and the familiarity of signed language at home. She and Humphries have a hearing daughter who is bilingual in ASL and spoken English, and currently a doctoral student in biology at UC San Diego. Padden earned a B.S. from Georgetown University in 1978, at which point she joined UC San Diego as a graduate student. Padden will serve as the fourth dean of the Division of Social Sciences. She succeeds Jeff Elman, distinguished professor in the UC San Diego Department of Cognitive Science, who is returning to his work on campus as an internationally recognized scholar of psycholinguistics and artificial neural networks. In her new role as dean, she intends to follow her own advice and plans to work closely with the students, faculty and staff in the Division of Social Sciences, helping the division continue doing its ground-breaking work on the science of society, pursuing research, teaching and service in the public interest.